Barbados announced a ban on single-use plastics to take effect on Apr 1st, 2019. 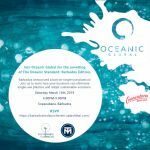 Oceanic Global is hosting an industry-focused event in partnership with local social enterprise, Sustainable Caribbean and, with support from global NGO, The TerraMar Project, will be launching at Copacabana Barbados on Sat, Mar 16th to present The Oceanic Standard: Barbados Edition as a toolkit to guide businesses in the hospitality industry through this transition. In addition to data on waste in Barbados from satellite activations, The TerraMar Project will present their #NoMoreButts campaign to spread awareness around the issue of cigarette butts as plastic pollution and provide the solution of collecting and properly disposing cigarette butts.